One hundred and eleven years ago yesterday, Dr. Seuss (or, Theodor Seuss Geisel) was born. Author and illustrator of 46 children's books, Dr. Seuss is one of the most well-known and beloved authors of all time, with his work having been adapted into 11 TV specials, four feature films, a Broadway musical, four television series and a theme park over the years. Theodor is my favorite author. I grew up reading his books and my collection of Dr. Seuss books has grown in doubles. Today I am blessed to be able to share my collections with my daughter's. It's pretty amazing listening to my 7 year old read Dr. Seuss books to her 3 year old sister. In honor of Dr. Seuss's birthday, for dinner we had Green Eggs and Ham. Today I will be sharing my recipe. Green Eggs and Ham is my daughter Lily's favorite book. 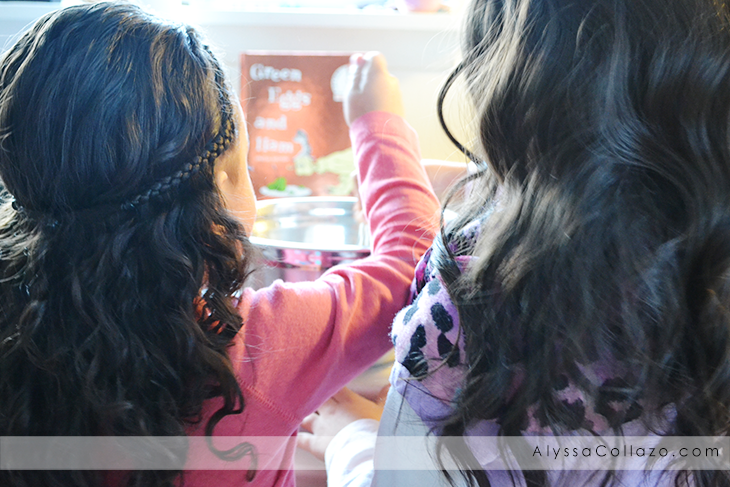 It's the first book she learned how to read and usually the first one she chooses to read to her sister, Sophia. It only seemed fitting that we had Green Eggs and Ham for dinner. With the help of my girls we created a pretty delicious meal. From cracking the Eggs to adding the Green food coloring my girls helped with everything! We added a vegetable side, Steamed Carrots and a grain, Honey Biscuits. Dinner was a filling, colorful, and tasty meal. Melt a tsp of butter or margarine in a large frying pan over medium heat. Add ham steaks and brown until edges are slightly crisp. Remove ham steaks from the pan, cover with aluminum foil. Set aside. In a Medium sized mixing bowl, combine the eggs, milk, salt and pepper. Beat with whisk until frothy. 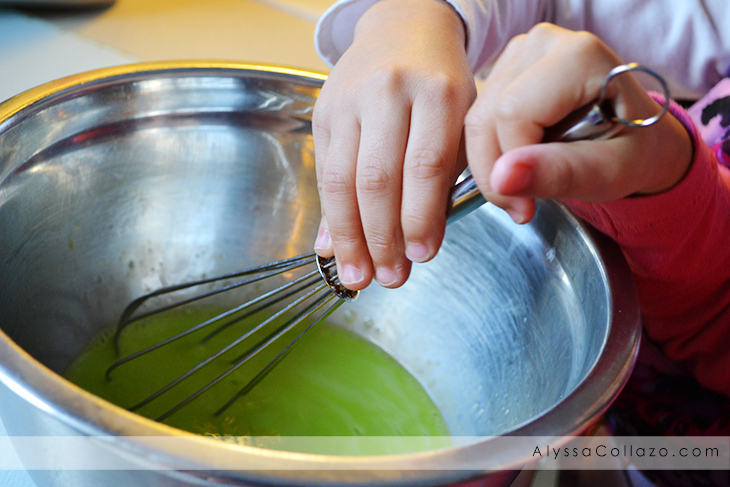 Then add 1-2 drops of green food coloring until you reach the desired shade of green. Heat 1 tsp of butter or margarine in a large frying pan over medium heat until the butter or margarine begins to sizzle. Then add the egg mixture to the pan. Stir the egg mixture with a spatula until the eggs are firm and not too runny. Transfer the eggs to individual plates. Add the ham steaks prepared earlier. Serve with toast or warm rolls. Ta-da! Dr. Seuss would be proud. Our eggs were the perfect shade of green. Right after dinner my girls said "I do so like Green Eggs and Ham! Thank you! Thank you! Sam-I-Am!" How did you celebrate Dr. Seuss's birthday? We celebrated by reading a book yesterday. I love the idea of depicting and putting into action what's in the book! That's so cool! 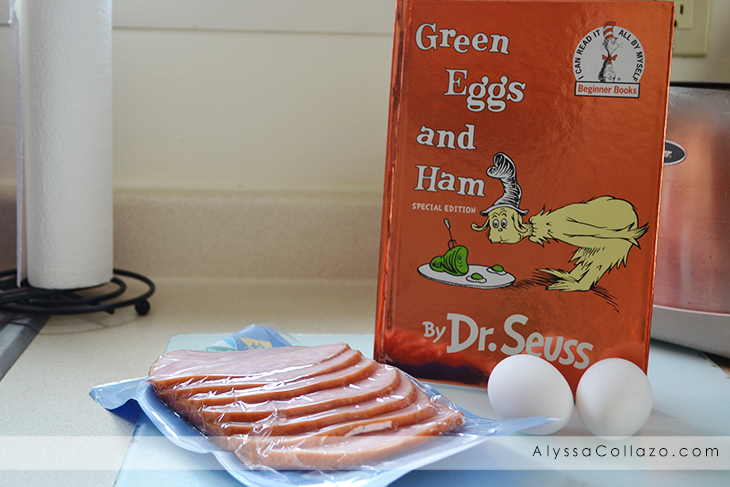 I've never thought of actually MAKING green eggs and ham before. Thanks! My children love Dr. Seuss almost as much as I do. I can't wait to make this. They'll flip their lids! That is awesome how you made green eggs and ham. How fun for the children. I never thought about making that before now. I've always liked Dr. Seuss. I still have my original green eggs and ham book.. It was always my favorite book growing up. My kids also loved it! happy Bday!! What a fun way to celebrate Dr. Seuss's birthday! Your daughters must have loved the fun and different food like green eggs! Love the idea! I love Dr Seuss and Green Eggs and Ham was one of my favorite books when I was little! What an awesome Mom you are by making green eggs!!! 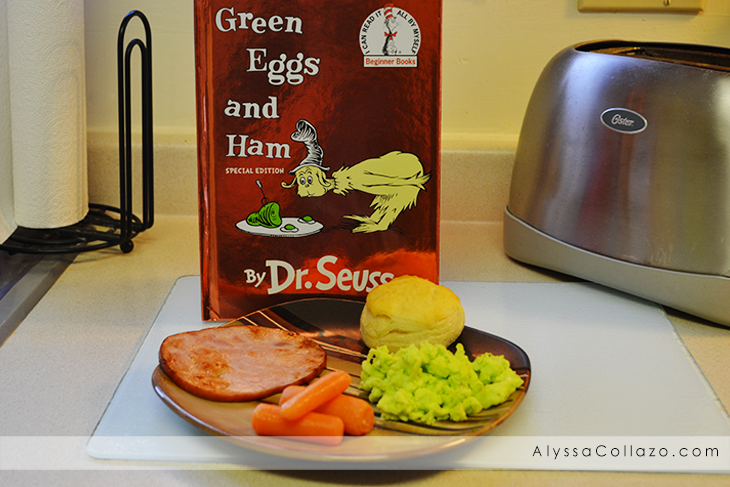 I love that you actually made real green eggs and ham! I can't think of a better way to celebrate the legacy of Dr. Seuss. I love Dr.Suess! :) Mom and us would read his books all the time and watch his movies. Love the green eggs and ham! I love Dr. Seuss books :) I can't wait to introduce them to my youngest. They're so fun and educational. This is so awesome. You are such a great mom! I don't know one person that has not read Dr. Seuss books. They have been read by parents and children for so many years indeed. I love the idea of the green eggs and ham dinner. My kids would have loved it when they were little. Thanks for sharing. This is so awesome and clever! I never would of thought of doing this haha. I absolutely love Dr Seuss books and can't wait to introduce my daughter to them. This is a great way of celebrating with kids. My kids are 13 and 16, so they are not as interested in celebrating Dr. Seuss' birthday. I love that you made the green egg and ham meal with your kids! What a cute post! I love the green eggs and ham! Who doesn't know Dr. Seuss or hasn't loved the books? Dr. Seuss is an icon. Very cute bonding!! I wish I have a daughter lol, BTW my kids ( naughty boys) loves green eggs, they're always have request to me to do it for them,. Such a cute post! Honestly, I can't ever say I was a Dr. Seuss fan (I know, I know), but my son loves the books. That Sam I am... that Sam I am... :) I think this is a cute idea and a great post too! Dr. Seuss is a fave amongst all three of my children, but we've never tried this. We'll definitely have to get cooking - looks like a lot of fun! I am loving all the fun Dr Seuss crafts! This is a creative way to celebrate. What a sweet thing to do. I love your green eggs and I bet your kids will always remember this treat.